Date: on Saturday, April 5th at 7:30 PM. The service will follow the traditional stations of the cross and will involve the entire assembly in a reflection on Christ’s passion through community song, readings, choral reflections and images of the passion. The images will incorporate works of art from centuries past, as well as contemporary paintings and photographs, in an effort to show the ways in which the Christ who once suffered, suffers still through injustices to his people: the foreigner, the poor. 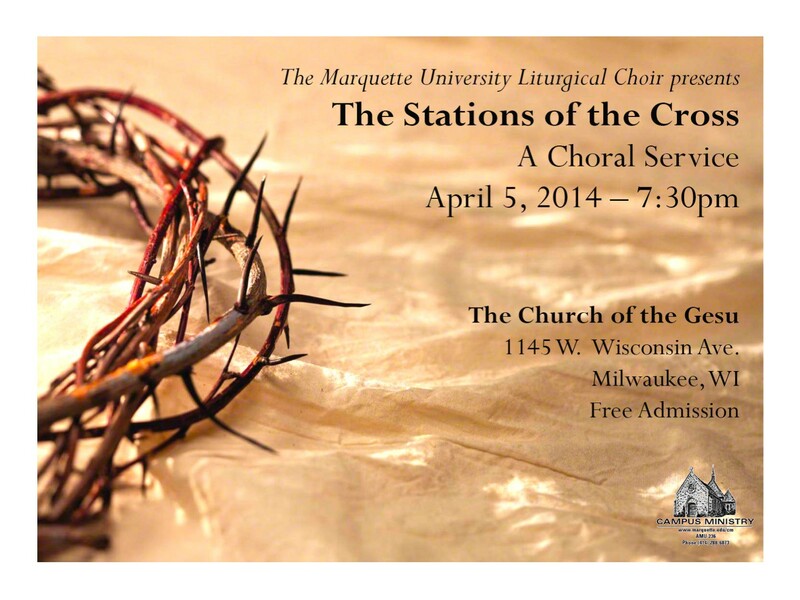 Admission to this choral service is free, but donations will be accepted following the service. Doors will open at 7:00 PM. Gesu Church is located on the corner of Wisconsin Avenue and 12th Street. Nearby parking is located in Lot F, or the parking structure on Wells and 12th Street. If you have any further questions regarding the this service, please do not hesitate to call Campus Ministry at (414) 288-3695.